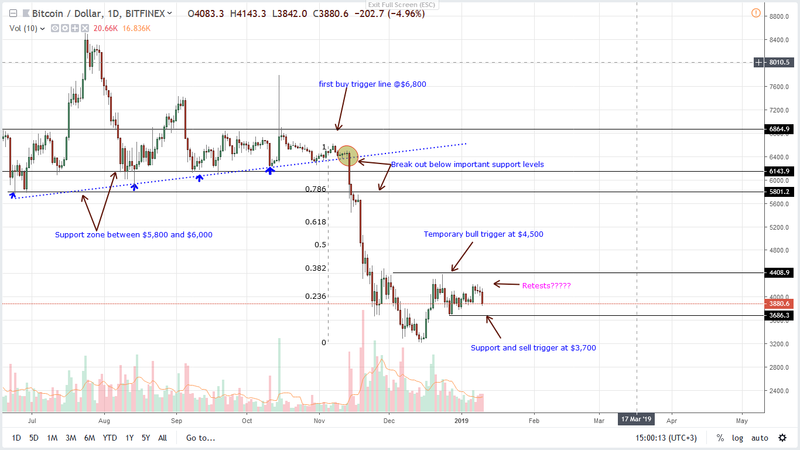 Bitcoin Price Analysis: BTC Slide 6.1%, Bull Party Over"
After today?s losses, subsequent price action would determine whether BTC is within a necessary bull squeeze or the retest of $4,100 marked the beginning of bear trend and completion of a retest. After all, the dominant trend is bearish, and rejection of higher highs is at the 38.2 percent Fibonacci retracement level of Nov-Dec 2018 high low. After decent performance throughout the last weeks of Dec 2018 and early this month, Bitcoin sellers are back. According to live streams from coin trackers, BTC is down 6.1 percent in the last day. Regardless, traders are optimistic and expect prices to rebound more so if there support at $3,700. If that is the case, then today?s drawdown is a bull squeeze driving prices towards the base of a bull flag. Buttressing Bitcoin are exchanges?a set of on-off ramps allowing buyers and sellers to exchange digital asset. As centralized marketplaces, they are a honey pot for malicious hackers always on the lookout for any vulnerabilities. Most successful hacks result in multi-million-dollar losses and topping the table is that mega-hack at Coincheck where an estimated $500 million evaporated just like that. It is for this reason why authorities, especially in SE Asia, Europe, and the US, are taking steps, executing their mandate and protecting vulnerable investors. Latest news is that the Ministry of Science and ICT while working closely with Korea Internet and Security Agency (KISA) has approved seven exchanges–UpBit, Bithumb, Gopax, Korbit, Coinone, Hanbitco, and Huobi Kore– after a three-month security inspection between Sep to Dec 2018. Still, bulls are resilient, and prices are trending above $3,700?our main support line. For trend continuation, it will be essential if bulls reverse these losses in subsequent days and drive BTC prices above $4,100 and later $4,500. If not and this persists then this will cease from being a bull squeeze.